So remember this list of all the things we want to do to the new house? My mom called me that night and said: I’m tired just reading this list. And honestly I kind of felt the same way! 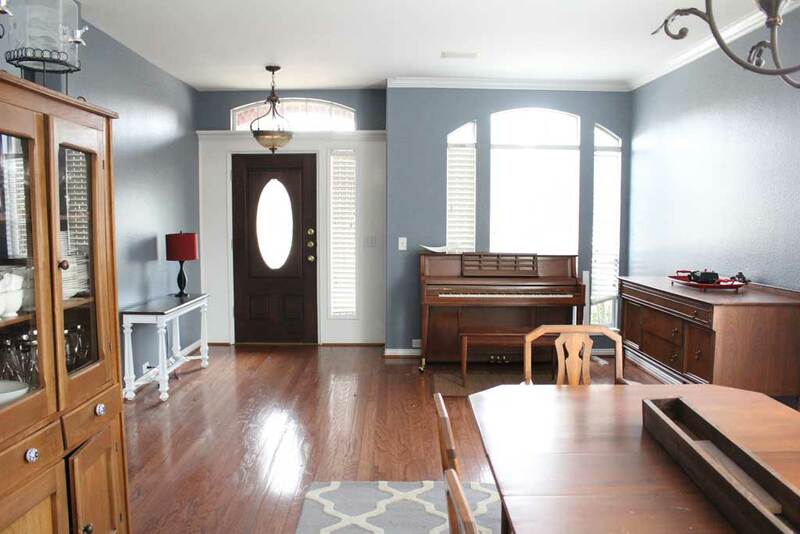 I love projects as much as the next person and seeing the house transform over time, but as the husband and I were talking, we realized that ‘paint this room’ showed up on almost ALL of the rooms on our To Do List. If he and I were left to paint all of those rooms ourselves, it would be 5 years before we get the house painted… and probably the tall stairway would never get painted. We decided to bite the bullet and hire out the house painting. All I have to say is Best. Decision. Ever. These guys were awesome, a week and a half after calling them, they came, moved all the furniture, took what few things we had hung on the walls off, patched our holes, and painted THE WHOLE HOUSE in 2.5 days. Seriously… all of it. I only have pictures of downstairs because everything was drying and needed to be put back and pictures taken… I’ll show you those next week. 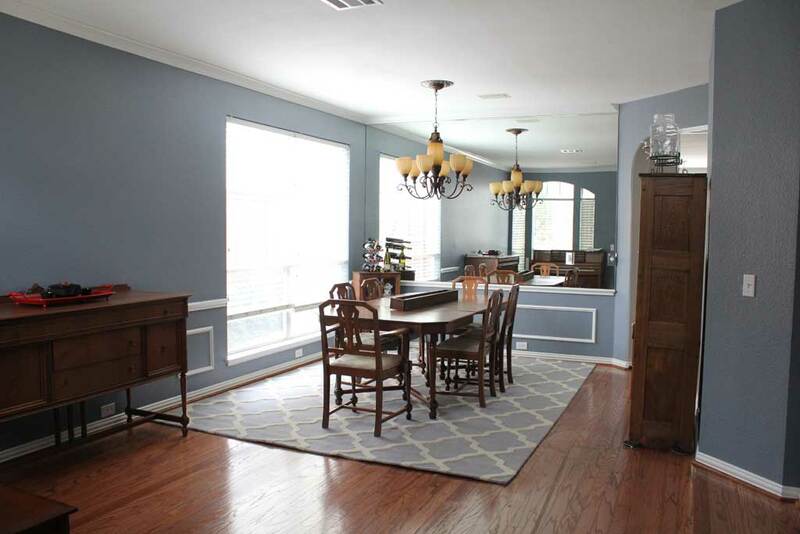 Since I only had a week and a half to pick Sherwin Williams Colors (which I’d never really used before) I spent a long time googling/pinteresting colors and we mostly decided to paint the whole house just one shade of gray, except the Dining Room and Master Bathroom are a darker blue color. 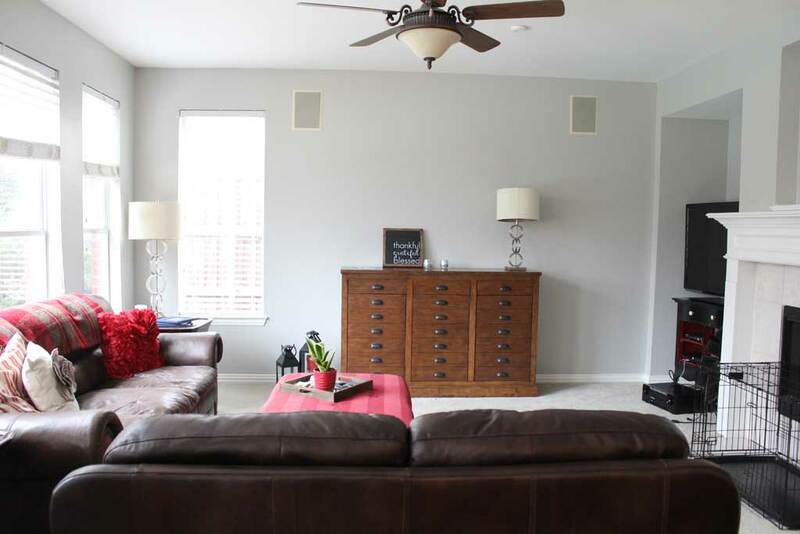 I painted 6 different gray swatches on the wall, but ended up settling with Light French Gray (the painter used all Sherwin Williams level 200 paints… which bonus are 0 VOC which means they don’t smell all that bad and are safe to be around for baby). I love this color! It is exactly what I was hoping for- a very cool gray that doesn’t have much (if any beige undertones) but also doesn’t read as blue. 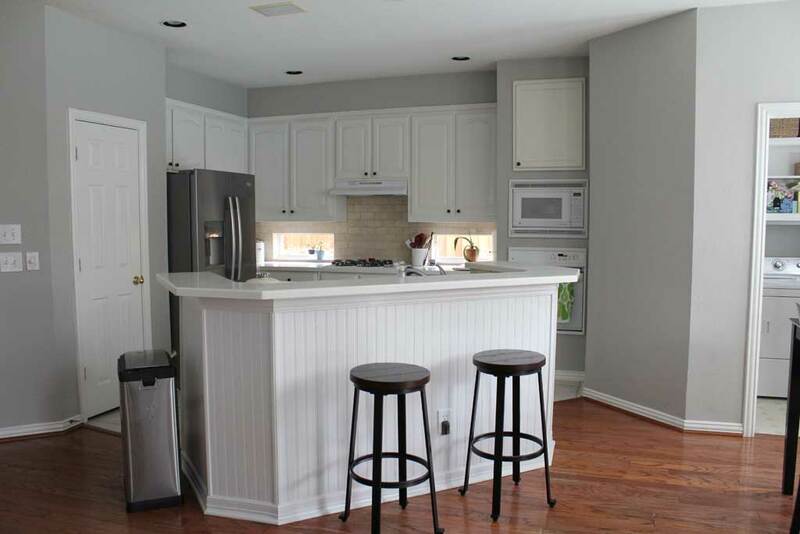 It definitely makes our white kitchen and white trim pop! 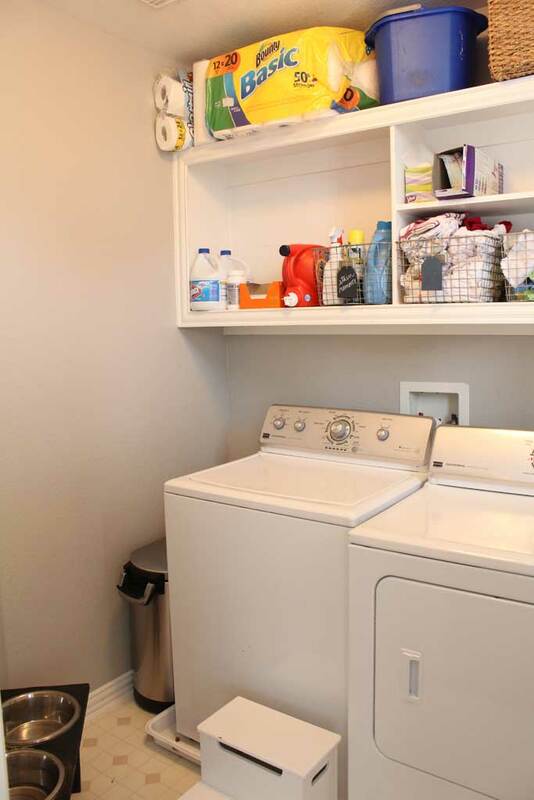 Since all these spaces are so connected we wanted to go with the same color in all of them to make them feel like one large space- and while they were at it I had them paint the laundry room the same color. I need to do some other things to make our laundry room more functional: like a drying rack, another shelf there on the left side, but since this is right off our kitchen, it has great storage space for us and is also the perfect space for Lexie’s food and water. And because the husband and I are super short… we need a step stool. But with this little step stool I can reach everything without having to climb on the dryer, which is getting harder to do as the months progress! Then in the Dining Room we went with Sherwin William’s Storm Cloud which I found because I found a bathroom on Pinterest done in Jubilee and liked the shade, but wanted it darker and moodier, so I just dropped down a spot on it’s swatch. I worried a little that it would be too dark, but I think with such a large room with so many windows it ended up PERFECTLY. 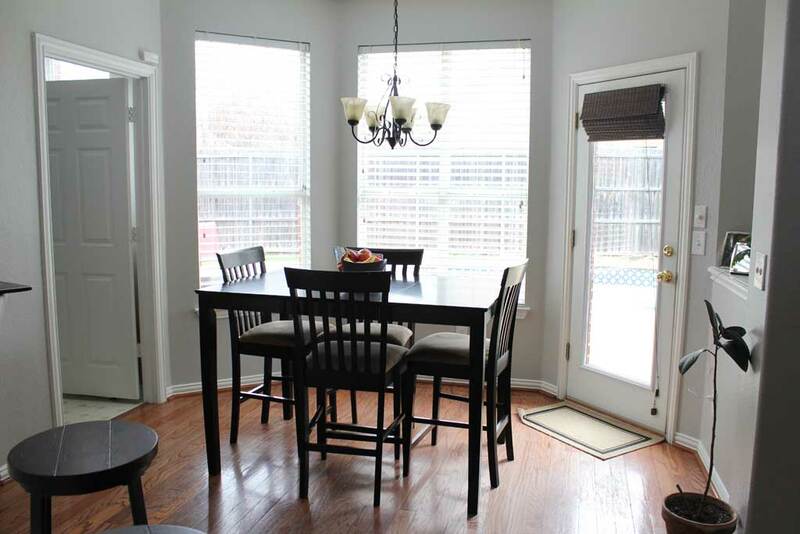 I definitely want a new light fixture above the table, and desperately need some curtains on the window in the picture above, but I love the way this room is coming together! It is definitely still a work in progress (and I didn’t notice that they didn’t center the piano… guess I should go home and fix that) but I could not be happier with the color!! It feels like a brand new house! I’ll be back next week with the upstairs pictures… you won’t even recognize our master bathroom and bedroom… HUGE transformation! I love the gray! The house is looking awesome!